Here are important formulas and shortcuts to solve problems on Boats and Streams. 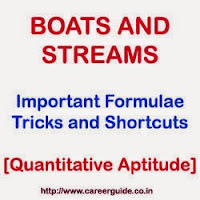 Basic knowledge regarding solving questions and problem on Boats and Streams is important for various competitive exams like IBPS, SBI Bank PO, assistant, SSC exams, Railway exam, UPSC exams. Click here to see tricks and formulae on Speed, Distance and Time. Example 1: A boat is moving downstream in a stream running at 5 km/hr. If the speed of boat in still water is 25 km/hr, find the time taken (in minutes) by boat to travel 5 km. Time = Distance / Speed = 5/30 hr = (1/6) * 60 minutes = 10 minutes. Example 2: A boat is moving upstream in a stream running at 5 km/hr. If the speed of boat in still water is 25 km/hr, find the distance traveled by boat in 30 minutes. Distance = Speed * Time = 20 * (1/2) = 10 km. Example 3: If speed of a boat upstream is 25 km/hr and downstream is 15 km/hr. Find the speed of the stream and speed of boat in still water. Example 4: In a stream running at 2 kmph, a motorboat goes 6 km upstream and back again to the starting point in 33 minutes. Find the speed of the motorboat in still water. Boats and streams practice sample paper -1 with detailed solution and answer key.